At first glance, the three-row Hyundai Santa Fe looks like a great value for money family crossover. But we should never take something purely at face value, so let's see how the Hyundai measures up when we compare the 2017 Ford Edge vs 2017 Hyundai Santa Fe in a direct Ford vs Hyundai head-to-head comparison. 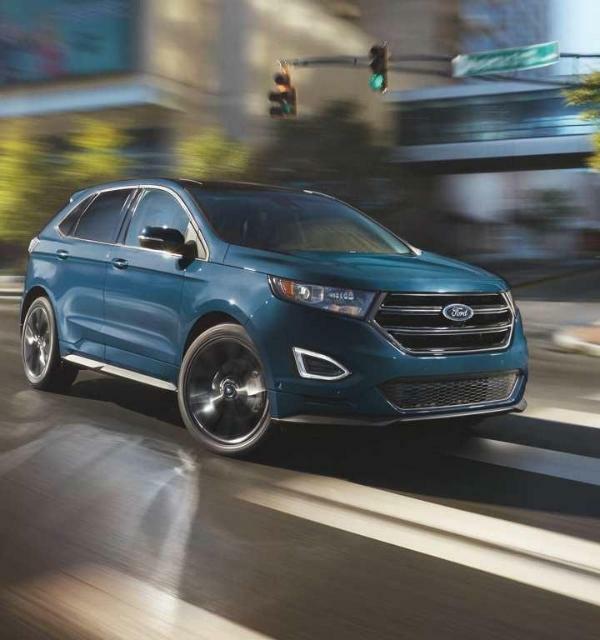 There's a decidedly sporty air about the way the exterior of the Ford Edge looks, which is only further enhanced if you go for the top-of-the-line Edge Sport model. There's nothing to criticize and everything to love about the Ford Edge styling, and it's actually hard to think of any demographic that wouldn't find it appealing. Some three-row crossovers and SUVs look big, clunky and awkward, but that can’t be said of the new Hyundai Santa Fe as it doesn’t look like a three-row as it's still very much a midsize. The Edge has the edge though for its all-round appeal, so first blood in our Edge vs Santa Fe contest goes to the Ford. Buyers have three different engines available to them in the 2017 Ford Edge, and the standard unit for all except the Edge Sport is a 2.0-liter EcoBoost inline-four that develops 245 horsepower and 275 lb.-ft. of torque. The Edge Sport gets a 2.7-liter EcoBoost V-6 with 315 horsepower, and the middle engine is a 3.5-liter V-6 producing 280 horsepower and 250 lb.-ft. The styling of the Santa Fe may be totally contemporary, but the same can’t be said of the single engine that's available. A 3.3-liter V-6 sounds like it will be ok, but when you find out it only produces just 290 horsepower, it's easy to see why we give this section to the Ford. Vehicles like these get used a lot, so fuel economy is definitely going to be a consideration. The best numbers the Edge offers come from front-drive models with the 2.0-liter EcoBoost engine with auto stop/start and front-wheel drive. The EPA rates those at 21 mpg in the city, 29 mpg on the highway and 24 mpg combined. The Santa Fe is pretty good for a V-6, but figures of 18 mpg in the city, 25 mpg on the highway and 21 mpg combined in front-drive form leave it trailing behind the Ford here too. There's no option for a third row of seating in the Ford Edge, so the five people it does accommodate get a pretty generous amount of room. There's 42.6 inches of legroom in the front and 40.6 inches in the back. That's slightly more than there is in the Santa Fe, but of course, that's no use if you need to accommodate six or seven people instead of five. The total passenger volume in the Edge is a relatively modest 113.9 cu.-ft., which is put into perspective by the Santa Fe's cavernous 146.6 cu.-ft. This round is a clear victory for the Santa Fe then. If you need a third row seat you’re obviously going to choose the Santa Fe, but otherwise it's hard to make a case for it over the Ford Edge. The Ford is a more modern on the outside, the inside and especially under the hood, and as it also costs a little less than the Hyundai it's definitely our choice here. For more information and to arrange a test drive in the superb 2017 Ford Edge, don’t hesitate to get in touch with us now here at Southern California Ford Dealers.